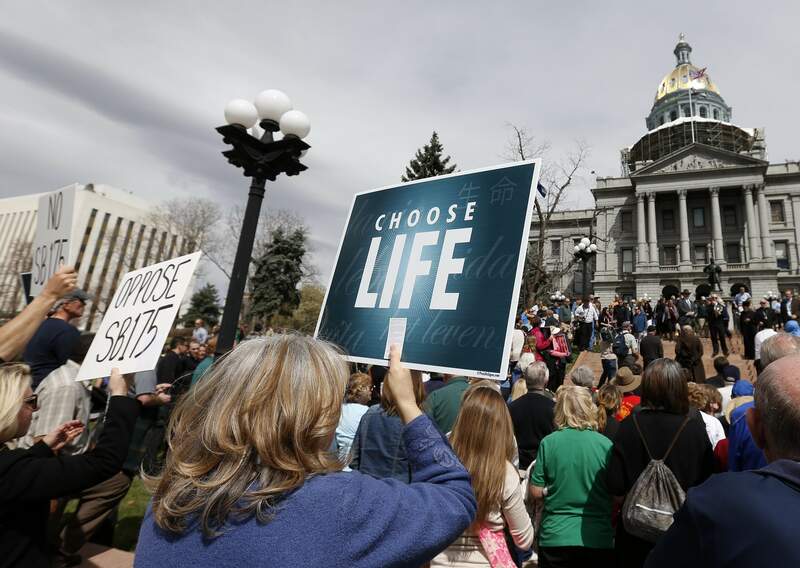 Anti-abortion demonstrators rally in April 2014 on the steps of the state Capitol in Denver. The 2016 election in Colorado has so far not focused on abortion, a shift from 2014, when the issue took the spotlight. DENVER – Abortion is not factoring into Colorado elections this year as it has in the past, with Democrats spending less time attacking Republicans on the subject. Compared with two years ago, when Democrats placed a nearly singular focus on abortion in their quest to oppose Republicans, more time was spent this year on the oddities of the campaign season, in which Republicans are constantly asked to respond to statements made by Donald Trump. Cory Gardner received the brunt of the abortion attacks in 2014, when he was repeatedly questioned over whether he supported a personhood ballot proposal, which would assign constitutional rights to the unborn in an effort to ban abortion. Personhood is not on the ballot this year, one reason for the diminished focus. U.S. Senate race 2014Democrats acknowledge that Gardner stayed brilliantly on message, constantly deflecting when asked the question while maintaining that he opposed personhood. He went on to defeat Democratic incumbent Mark Udall for the U.S. Senate seat. Ilyse Hogue, president of NARAL Pro-Choice America, called it the “Cory Gardner playbook,” a strategy employed by Republicans across the nation in the current election. “We didn’t actually suspect that Cory Gardner was going to lie in 2014, which is on us, I own that,” Hogue said during a recent stop in Denver. She said abortion rights advocates did not expect Gardner to so strongly distance himself from personhood. Gardner campaign staff and consultants declined to comment for this story. The issue at the time was that Gardner maintained that there was no federal legislation tantamount to Colorado’s personhood initiative. While Gardner disavowed the statewide initiative, he was listed as a co-sponsor on the federal Life Begins at Conception Act, which the bill’s authors explained was an effort to establish personhood. Left-leaning special interests and the Democratic Party bombarded Colorado voters with mailers and television commercials in 2014, painting Republicans as unsympathetic to a woman’s rights and choices. Few of those ads have been seen in Colorado so far this cycle. After 2014 election, observers questioned whether Democrats and the Udall campaign pandered to women, perhaps over-estimating abortion as a sole issue of importance to women. In this year’s U.S. Senate race between Democratic incumbent Michael Bennet and Republican Darryl Glenn, Democrats have largely steered away from the abortion issue. Debate in GOP circlesThe few public discussions about abortion have largely taken place within Republican and anti-abortion circles. While Colorado Right to Life has been hesitant to back Glenn as a staunch anti-abortion crusader, National Right to Life has endorsed him. Glenn has described himself as an “unapologetic Christian pro-life” candidate. Bob Enyart, spokesman for Colorado Right to Life, said every top-ticket candidate “will continue to intentionally kill unborn children by their policies,” including Trump. “So while many pro-life leaders and groups love being lied to, and go back over and over again to be treated like political harlots, at Colorado Right To Life, we don’t support those who advocate killing children, especially if they claim to be Christian, conservative, Republican, or pro-life,” Enyart added. Kyle Forti, a Republican strategist whose Denver-based firm, D/CO Consulting, is assisting with Rep. J. Paul Brown’s re-election campaign, believes Republicans are simply taking a more measured approach, a strategy that has left Democrats with less fodder. “If Republicans were smart they’d support potential programs, or legislation, that do provide better access to contraception, better access to education, because if they’re truly interested in saving the lives of the unborn, then these preventative measures can go a very long way to decreasing abortion,” Forti said. Brown serves as an example. In 2015, he supported funding for a program that provides intrauterine birth control to low-income teens. But he backtracked this year during a budget vote, electing to strip funding for the program. The funding cleared the Legislature. A wedge issueLeft-leaning groups like ProgressNow Colorado say it’s early in the election, and abortion is likely to pop up in terms of a wedge issue that could be used against Republicans. Brown may see some of that opposition, said Ian Silverii, executive director of ProgressNow Colorado.